This paper explores Picasso’s approach to sculptural materials during the cubist years through a close examination of his 1914 construction Still Life. Made from partly recycled and partly carved wooden elements, the table-top scene reveals the artist’s control of his techniques and materials. This technical study helps to explain how Pablo Picasso made one of his earliest cubist constructions, Still Life 1914 (fig.1),1 what his intentions were and how he achieved them, and how the work has changed with time. Conservators have published technical studies on Picasso’s paintings,2 but less attention has been paid to his early sculptures. 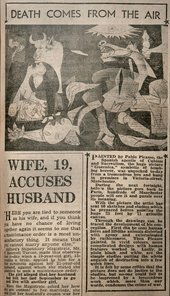 This article suggests ways in which Picasso controlled his materials to emphasise the basic, almost crude, effect he sought. The artist’s failure or refusal to efface evidence of the way the work came into being gives the impression of hasty or rough workmanship, and at the time Still Life was made, this was unusual, even shocking, in a serious work of art. Still Life is a relief constructed from partly recycled and partly carved wooden elements with the addition of a piece of textile. Like many of his cubist collages and constructions, Still Life takes its subject from the café and everyday life. Introducing a workman’s lunch into a work of art was in keeping with Picasso’s subversion of ‘pure art’. His identification with the life and work of ordinary Parisian artisans probably influenced his subject matter.5 Most sculptures produced in the nineteenth and early twentieth centuries idealised the human condition, and the skill of the sculptor was clearly evident. For Picasso, along with the change of subject-matter, came the desire to reveal the creative process, or at least not to hide it. This construction is made from twelve pieces of pine and poplar wood,6 nailed and glued together to form a table that supports a knife, a piece of bread with two slices of sausage and a glass. A segment of upholstery fringe is fixed to the table’s edge, suggesting a tablecloth. The painted depiction of food was common in paintings up to the period when Still Life was made, but was never a favoured subject for sculpture. Picasso’s decision to represent prepared food may be symbolic but it also reflects an interest in everyday activities. The artist himself is known to have lunched on bread and sausage while painting, and Jaime Sabartés refers to the significance Picasso attached to food: ‘In conversation, too, he often recurs [sic] to food as symbolic of a situation or to colour his expressions … In his writings there is a profusion of names of dishes, recipes, vegetables and fruit’.7 Just as the snack on the table in this construction represents a moment in the process of consumption, the workmanship also appears to be a moment in a process of production. A rectangular piece of pine, one centimetre thick, acts as the backboard or wall to Still Life and might have originally come from a food or wine crate, as both front and back are roughly hewn. The sides of the board have been unevenly cut, probably with a panel saw, and no attempt has been made to finish or paint the splintered rough saw marks.17 (fig.3) Paradoxically, the top and bottom edges are very straight but are hidden behind the attached elements. Since the backboard defines the space of the composition, Picasso seems to have consciously opted to expose the more uneven sides, forcing the viewer to contemplate the rough-cut wood as part of the making process. A favourite motif found in Picasso’s paintings and constructions from this time is the pedestal table. A photograph of his studio from 1911 shows a real pedestal table with a fringed tablecloth. He was known to have loved passementerie (fringes and tassels used on curtains and furniture). Picasso once spoke passionately for twenty minutes to William Rubin about tasselled furnishings.18 The table in Still Life is sawn from a piece of one centimetre thick pine, and is angled at about 45 degrees, which alters the perspective so that we view the scene almost from above, with the table tipping dangerously forward. This effect is created deliberately by supporting the table from beneath with two pieces of wood nailed to the backboard. The table surface has an underlying cream colour with a top layer of dark grey paint.19 By exposing the underlying cream colour, Picasso suggests the shadows cast by the knife and glass. The underside of the table, although not visible, is neatly painted cream. Picasso conflates the iconography of a working-class lunch with that of bourgeois home decoration using a piece of tasselled fringe. The tassels are tied twice forming a small onion shape and are referred to as ‘onion’ tassels: Picasso might have been aware of and enjoyed this visual food pun.20 The admission into the work itself of selected but otherwise untransformed fragments of the real world meant that art was not only addressing the everyday but being visibly invaded by it, challenging the concept of art as something precious and valuable. The craftsmanship evident in the work echoes this view. The salami sausages, made from pine wood, appear to have been fabricated by sawing slices with a coping or bow saw by hand from a 40 mm diameter wooden dowel, perhaps originally from a chair leg or curtain pole. The two slices of sausage, both of the same diameter with the end grain painted reddish brown, rest on a thick square wooden slice of bread, marked by carved depressions representing air pockets. The grooves and chisel marks vividly capture the movement of Picasso’s fingers as he gouged bits of wood using a 7 mm gouge, and possibly a carving knife, to create ten dimples.23 Splinters of wood remain in the indentations and have been painted a cream colour, contrasting with the brown upper surface and grey edges. Picasso exploits the different qualities of the paint, accentuating the contrast between the matt surface of the bread and sausage with the smooth glossy surface of the glass and table. X-radiography reveals an abundance of more than fifty factory-produced nails in this small construction (fig.4). While they are all functional, some also become integral to the design. The most inventive use involves those that secure the knife to the table. The knife is most probably of poplar and measures the same thickness as the glass and bread, suggesting they all came from the same piece of wood. The knife was probably made using a saw, flat chisel and knife. (Picasso perhaps enjoyed the idea of using a real knife to make a wooden one). Once assembled, it was painted white and a black circle was then painted around each of the three 2 mm nail heads to simulate rivets on the handle (fig.5). The slices of sausages are secured to the bread with six nails; three nail heads were also painted black to represent the variegated spots found on sliced sausage. Rather than trying to conceal this dual function, this feature appears to emphasise the fact that Picasso enjoyed and wanted to share it. His appreciation of simple, skilful manipulation of materials is evident in his description of some found wooden boxes: ‘I saved them from a dustbin tonight on the way home. That boxes could be so ingeniously and yet so simply made is quite marvellous! Look how clever they are! The lids open and close with just two little nails in the place of hinges. Real works of art’.26 This inventive use of nails can be seen in other works from as early as 1907 as in, for instance, the eyes in the wooden Doll (Spies 21) which are made of metal studs or nails,27 and in Violin and Bottle on a Table 1915–16 (Spies 57, fig.6) in which the three nails that hold the violin strings become part of the instrument. How he arrived at this method is not known but it is possible that he was influenced by tribal artefacts which incorporated nails into their design. 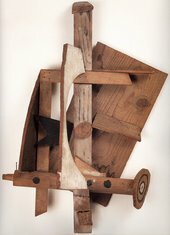 This work is dated at least one year after Still Life, indicating that Picasso either retained these pieces of wood from one year to the next or that he worked on several constructions at the same time. Another corresponding component has been found in Mandolin and Clarinet 1913 (Spies 54; fig.8). Picasso has used a 40 mm diameter wooden dowel to make the clarinet. It is likely that the disc that denotes the sound hole of the mandolin was sawn from this dowel, as the diameter is the same. The pieces of sausage in Still Life may have also originated from this piece of wood.31 Picasso would have cut ‘slices’ from the end of the dowel before finishing Mandolin and Clarinet. As the latter work predates Still Life,32 however, he may have worked simultaneously on these constructions. Not only did Picasso leave clues about how and from what this work was constructed, but he also left visual evidence of how the work evolved. Close examination, cross sections and an ultraviolet light source show that Picasso probably attached some of the elements before applying the paint. Still Life is related to a painting of the same time, Glass, Newspaper and Bottle 1914 (fig.9). It is not known whether the painting preceded the sculpture, but there are some striking similarities. Both contain details of the moulding, glass and knife. However, a newspaper and bottle are central to the composition in the painting. Might these elements have once been part of the arrangement in Still Life?33 Cross-sections of paint from the backboard and pentimenti reveal that there was once a dark grey trapezoid shape reminiscent of the newspaper outline in the painting. If we imagine a dark grey shape, the composition changes, creating a tonal contrast which was frequent in many of Picasso’s collages from this time. This grey shape was carefully covered by the subsequent glossy cream paint layer, which was applied wet-in-wet.34 Visible to the naked eye and accentuated under ultraviolet light, a cascade of repeated curves terminates in a semicircle on the tabletop (fig.10). This profile suggests that at one time a shape similar to the bottle in the painting might have been in the original composition. The shape also recalls the double-curve, half-guitar motif that is so prevalent in the artist’s early works. Picasso was almost certainly surrounded by a variety of constructions in his studio: it is not known whether they were in varying states of completion, but at some point he must have changed his mind and simplified the composition. There are at least two coats of paint on most of the construction. The first layer of cream paint has a granular texture. This undercoat would have sealed the wood and created a semi-absorbent surface on which to apply further layers.35 The paints are linseed oil-based and the presence of leaded zinc white suggests an industrial product. We know Picasso enjoyed the working properties of these oil-based paints.36 Cross-sections of the cream coloured paint reveal well-dispersed pigments, indicative of machine-ground paint. Commercial paint is not designed for permanence of colour, and the cream colour probably has darkened over the past ninety and more years since it was completed. Picasso’s views on conservation are not clear, but we know that he was vehemently opposed to varnishing his paintings, as he felt that this process changed the texture and falsified tonal values.37 He once threatened to confiscate two paintings that had been varnished without his permission.38 When asked in 1965 about cracks in the paint surface on The Three Dancers 1925 (Tate), Picasso said ‘some people might want to touch them out but I think they add to the painting. On the face you see how they reveal the eye that was painted underneath’39 He seemed to relish the notion that the viewer now had a glimpse into how he created his work. He also appeared to be aware of the ageing of his works. Gertrude Stein once summed up his thoughts: ‘After all, if it all ages together why not?’40 While we accept the changes that have occurred to Still Life, we actively limit its exposure to light to slow down future changes and it is currently displayed under a Perspex cover to preserve it for future generations. 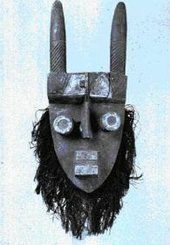 This article has explored the notion that Picasso not only used unconventional materials in defiance of ‘high’ art, but that he carefully controlled his techniques to accentuate his abandonment of traditional craft. Although his carpentry skills were limited, he would have had the ability to prepare and prime the wood surfaces had he wanted to produce a more refined look. Picasso’s Still Life is skillfully constructed and the examination and analysis of this work reveals an intimate connection between the artist’s choice of materials and the visual effects he intended. The viewer is challenged both to accept the intentionally crude finish of the work and recognise the material evidence of the creative process. 1. W. Spies, Picasso: The Sculptures, Ostfildern-Ruit 2000, p.92. 2. See, for example, A. Hoenigswald, ‘Works in Progress: Pablo Picasso’s Hidden Image’, in Marilyn McCully (ed. ), Picasso, The Early Years, exhibition catalogue, National Gallery of Art, Washington, 1997, pp.229–308; M. Duffy, ‘Les Demoiselles d’Avignon: Core of Picasso’s Laboratory’, International Institute of Conservation, Congress Proceedings 2004, Bilbao 2004, pp.133–6. 3. I thank Elizabeth Cowling for her helpful comments on the questions of chronology in relation to these constructions. 4. William Rubin (communication to the author, February 2003) explained that Picasso was particularly attached to these early constructions. Twenty-two years elapsed before he exhibited Still Life at the 1936 Paris Exposition surréaliste d’objets. After this he gave the work to his close friend the poet Paul Eluard. Roland Penrose bought it in 1938 and sold it to the Tate Gallery in 1969. 5. E. Cowling, Picasso: Style and Meaning, London 2002, p.229. 6. Microscopic analysis by Royal Botanic Gardens, Kew, London, 2002, report in Tate Conservation File T01136. 7. J. Sabartés, Picasso, London 1948, p.91. 8. R. Johnson, The Early Sculptures of Picasso, 1901–14, New York and London 1976, p.122. 9. J. Richardson, A Life of Picasso 1907–1917: The Painter of Modern Life, London 1996, p.254. 10. See ibid., p.287; and E. Cowling and J. Golding, Picasso: Sculptor/Painter, exhibition catalogue, Tate Gallery, London, 1994, p.22. 11. Cowling 2002, p.257 note 5. 12. Cowling and Golding 1994, p.194 note 10; and P. Karmel, ‘Beyond the Guitar: Painting, Drawing and Construction, 1912–14’, ibid., pp.189–96. 13. W. Rubin, Primitivism in 20th Century Art: Affinity of the Tribal and the Modern, exhibition catalogue, Museum of Modern Art, New York, 1984, p.316. 15. W. Tucker, The Language of Sculpture, London, 1974, p.60. 16. For further discussion on this, see Spies 2000, p.83 note 1. 17. Personal communication with Tate cabinet-maker Jack Warans who suggested Picasso probably used a cross-cut saw with 9–10 teeth to the inch. 18. Rubin 1984, p.316 note 13. 19. THM-GCMS analysis (thermally assisted hydrolysis, methylation gas chromatography-mass spectrometry) revealed that the grey paint consists of bone black and iron black in 50 per cent of lead white with chalk clay silica and talc, EDX EDX-Quant analysis (analysed by Fotini Koussiaki, 2002; report in Tate Conservation File T01136). 20. For Picasso’s enjoyment of visual punning, see R. Rosenblum, ‘Cubism as Pop Art’, in K. Varnedoe et al., Modern Art and Popular Culture: Readings in High and Low, New York 1990, pp.116–34. 21. Microscopic analysis (analysed by Joyce Townsend, 2002; report in Tate Conservation File T01136). 22. Tucker 1974, p.70 note 15. 23. The indentations were probably roughly carved out with a knife and there is evidence that the same 7 mm gouge was probably used to make the fluting in the glass. 24. 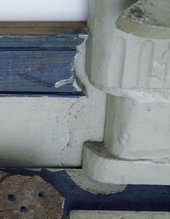 Blue paint sample taken from the moulding was analysed by GCMS as a mixture of poppy oil with pine resin. Infrared spectra of that blue showed Prussian blue in oil medium, zinc driers and lead white (analysed by Fotini Koussiaki, 2002; report in Tate Conservation File T01136). 26. Brassaï, Conversations avec Picasso, Paris 1964, p.233. 27. I am grateful to Elizabeth Cowling for suggesting Doll anticipates the cubist constructions. 29. Analysis revealed a first layer made of pure zinc white; a second layer, a yellowish transparent layer, also containing pure zinc white but richer in medium; and a third semi-transparent layer consisting of 90 per cent zinc and 10 per cent lead driers (leaded zinc white) and traces of chalk (analysed by Fotini Koussiaki, 2002; report in Tate Conservation File T01136). 30. The disc from Violin and Bottle on a Table was measured at Musée Picasso, Paris, in November 2006. 31. The dowel and discs measure 40 mm diameter; disc on Mandolin and Clarinet was measured at the Musée Picasso, Paris, in November 2006. 32. There is uncertainty about the date of Mandolin and Clarinet. P. Karmel (Picasso and the Invention of Cubism, New Haven and London 2003, p.183) dates the work to autumn 1913. 33. My interpretation is that the painting was made first and then translated into three dimensions. The surface of the painting below the moulding appears to have been reworked suggesting that Picasso also made changes to the painting. However, I was not able to examine the painting to confirm this. Karma, op.cit., (note 32), p.175, confirms Picasso was translating sculpture to paintings and paintings to sculpture during 1913. 34. Wet-in-wet means that the top layer is able to soften the underlying layer, and mix with it. Analysis revealed leaded zinc white with traces of chalk and a copper pigment; analysed by Fotini Koussiaki, 2002: report in Tate Conservation File T01136. 35. Analysis of this first layer revealed a pure zinc white with varying quantities of medium, ibid. 36. Richardson 1996, p.225 note 9. 39. R. Alley, Catalogue of The Tate Gallery’s Collection of Modern Art, London 1981, p.605. 40. G. Stein, Picasso, Boston 1959, p.27. This article first appeared in the Burlington Magazine in November 2008. Jackie Heuman is Head of Sculpture Conservation at Tate (job share). 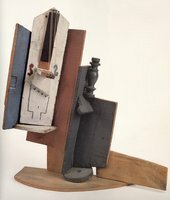 Jackie Heuman, ‘A Technical Study of Picasso’s Construction Still Life 1914’, in Tate Papers, no.11, Spring 2009, https://www.tate.org.uk/research/publications/tate-papers/11/technical-study-of-picasso-construction-still-life-1914, accessed 25 April 2019.